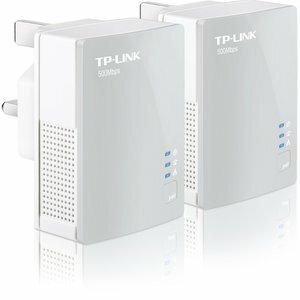 TP-Link's TL-PA411 500 Mbps Mini Powerline Adapter turns your existing powerline into a high speed network with no need for new wires or drilling. No configuration is required, simply plug your adapters into your power sockets and you can establish networking infrastructure in a flash. With a speed of up to 500 Mbps, the TL-PA411 transmits multiple HD streams and even 3D movies to every room, making it a great choice for an easy to build multimedia entertainment network. With advanced HomePlug AV technology, the TL-PA411 provides users with stable, high-speed data transfer rates of up to 500 Mbps on a line length of up to 300 m. Together with its built-in Qos and powerful AES encryption, the TL-PA411 is a great choice for a whole home solution to connect all network compatible devices - from computers and game consoles to set-top boxes for IPTV to printers and NAS hard drives. By pushing the Pair button on the adapters, users can set up a hassle-free Powerline network within minutes, complete with 128-bit AES encryption for network security and data protection. The TL-PA411 is a new-generation Powerline Adapter, with a practical design. The sophisticated Power-Saving Mode consumes less power when compared with existing Powerline Adapters; when there is no data transmission or reception for a certain period of time, it will automatically switch from its regular 'Working' mode to 'Power-Saving' mode that will reduce its energy consumption by up to 85%. Download . Related Product AV500 Mini Powerline Adapter Starter KitTL-PA411KIT AV500 Gigabit Powerline AdapterTL-PA511 AV500 Gigabit Powerline Adapter Starter KitTL-PA511KIT FAQ Troubleshooting information for your product .. Facebook Twitter Linkedin Download Contact Us . Copyright © 2012 TP-LINK Technologies Co., Ltd. All rights reserved.